The Pyle PIPCAM IP Camera and WiFi Recording System is easy to setup and operate. Make wireless surveillance simple and readily available where necessary with the help of the 'Pyle IP Pro' app. The app is free to download, available for iOS and Android devices -- so it works with all of your favorite Smartphones, Tablets and Computers (Mac & PC compatible). Turn on the app and connect to your camera for a closer look from a remote location with real-time video display. Whether used at home or at work, to add an extra line of security or to just monitor pets while away, you will now have the ability to access high-quality video surveillance that is viewable from any location. The system includes everything necessary to get connected. Unique PIPCAM features include programmable alarm Email alerts to notify you every time the camera senses movement thanks to the motion detector function, night vision low-light illumination and an auto-record schedule timer. 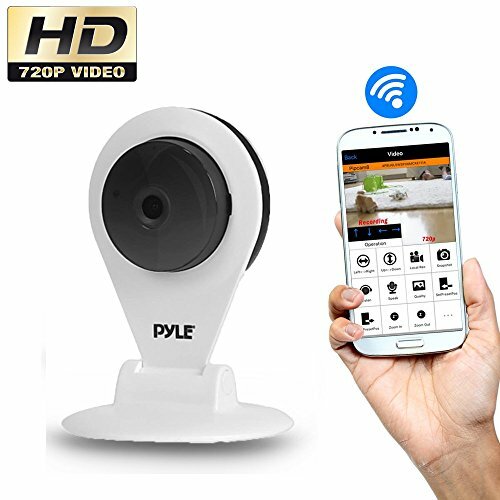 Get connected and monitor the situation with the Pyle PIPCAM WiFi IP Camera! MOBILE AND DESKTOP ACCESS: Remote monitor the wireless ip cam via p2p cloud stream like a pro from any single ios Apple iPhone - Android mobile smart phone electronic using smartphone app or Mac - PC Windows home laptop or desktop computer with one internet network.